The Institute for the History and Theory of Architecture (gta) was founded in 1967 at the then architecture department of the ETH Zurich – a teaching facility and research establishment with an archive, publishing house and a programme of exhibitions, which as the “gta” quickly achieved international renown. From its beginnings, the gta has seen its role as to capture and reflect upon the nature of architecture in all its historical depth and ideological breadth. Above and beyond this, it has constantly endeavoured to evaluate the validity of the methods applied in architecture and urbanism as models and to harness their usefulness for contemporary praxis. For this reason, teaching and research at the gta has never been solely focused on the history of architectural knowledge, the forms and techniques of construction or building analysis, but instead has always equally encompassed the inter-relationships of art, architecture and urban planning with society and politics from earliest stages to today. The fiftieth anniversary of the institute is an occasion to simultaneously undertake a review of the past and an outlook on the future. 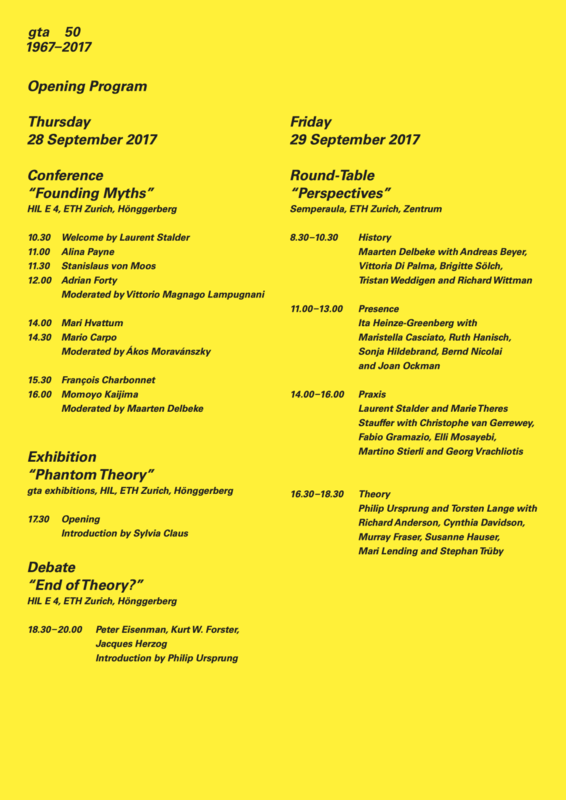 Therefore on 28 and 29 September 2017 the gta has put together a conference, a round-table discussion and the launch of an exhibition, all of them fully reflecting the spirit of history and the present-day, theory and praxis – the four very cornerstones of the institute that have constituted the complementary yet simultaneously antagonistic referential frameworks for the gta’s work since 1967. Architecture, more than any other area of knowledge, requires the idea of a beginning. The topic of the founding myth – that of the gta Institute and the ETH’s school of architecture too – is therefore the common denominator for a series of contributions by international researchers. 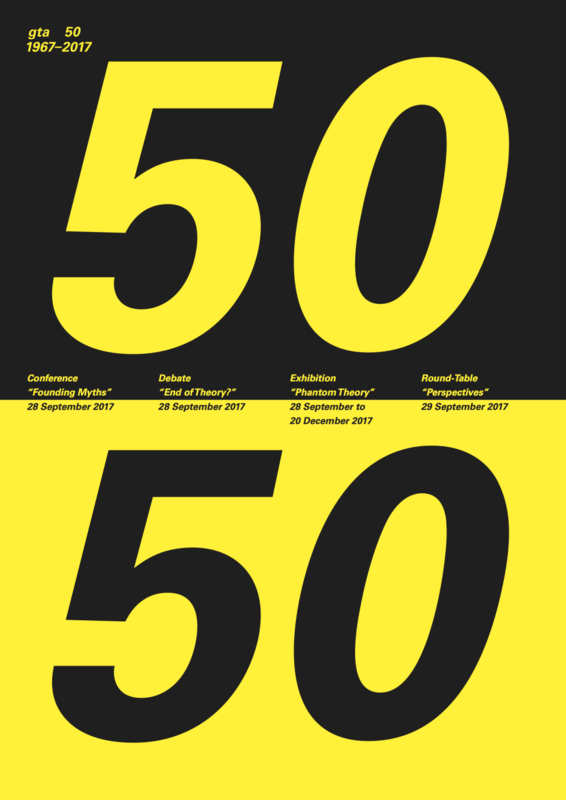 Whilst the proceedings on 28 September are dedicated to the fundamentals of the discipline, on 29 September a large round-table discussion pursues the current situation and the future of the history and theory of architecture as an academic discipline. Following the conference, on the evening of 28 September Peter Eisenman, Kurt W. Forster and Jacques Herzog will discuss whether the theory of architecture has arrived at an end. Whereas Eisenman and Forster belonged to the proponents of a close dovetailing of theory and praxis in the 1970s and 1980s, Jacques Herzog represents the absorption of theory in the works of a star architect at the turn of the millennium. Using projects, manuscripts, lecture drafts, models, exhibition concepts and images from the gta Archives, the exhibition presents the rich spectrum of questions and differing narrations with which the institute has been preoccupied over the course of half a century and that have productively shaped architectural praxis. The aspect that connects all of the researchers at the institute during this era and beyond is the constantly renewed aim to extract models from history as propositions for contemporary architecture. Nevertheless, what in historical retrospect appears to possess coherence often eludes ascertainment in everyday praxis. Seen from this perspective, theory is comparable to a ghost unable to find its last resting place.